eng 'Everyone in Greenall Bridge knew Sam Carraclough's Lassie. In fact, you might say that she was the best-known dog in the village ...because nearly every man in the village agreed she was the finest collie he had ever laid eyes on.' 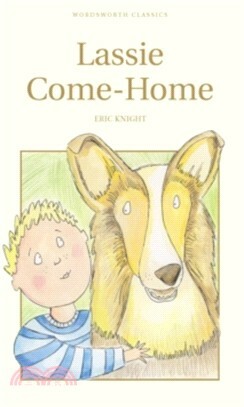 Sam's son Joe and Lassie are a devoted pair but a time comes when they have to be parted. The Carracloughs are not well off and when they fall on hard times Sam is forced to sell his champion dog to the Duke of Rudling, whose great estate borders their Yorkshire village. But Lassie escapes and makes her way home to the Carracloughs. The Duke, not one to be tricked by a dog, claims Lassie back and she is taken many miles away to the Duke's other home in Scotland. But again Lassie pines for her proper home and escapes. Undaunted by the challenge, she sets off on the long trek back to her Yorkshire home. She faces many dangers and adventures along the way but she also meets some kind people who offer her help and comfort. At the end, when Joe has given up all hope of ever seeing his long-lost companion again, the weary Lassie returns and he finds her waiting for him at the school gates in her accustomed spot, just like old times. Lassie and Joe are joyfully reunited. Against all the odds, Lassie has come home!